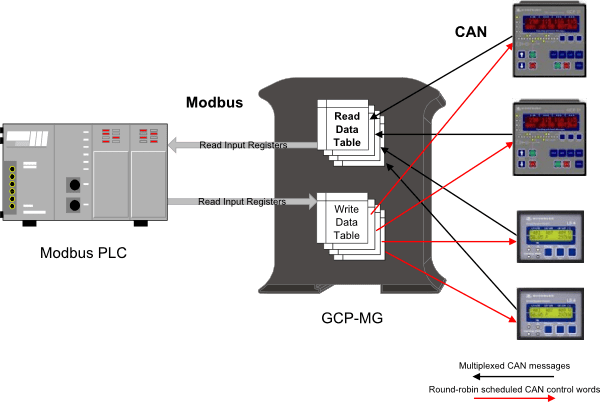 GCP-MG is a next-generation Modbus/CAN gateway specifically designed to interface Woodward's GCP-30 series genset controls (GCP-31, GCP-32), and LS 4 circuit breaker controls with Modbus networks. The GCP-MG gateway has been developed in cooperation with Woodward to ensure the highest possible degree of interoperability with Woodward equipment. The gateway features CAN, serial RS-232 and RS-485 ports as well as an Ethernet port and can be mounted on a DIN rail. On the CAN side it implements the Woodward CAL protocol to connect to the GCP controls. On the serial ports and on Ethernet it implements a Modbus server (Modbus RTU and Modbus/TCP) and accepts connections from Modbus master devices like PLCs and SCADA systems.